There are no comments for Bamboo Morning Tea. Click here to post the first comment. 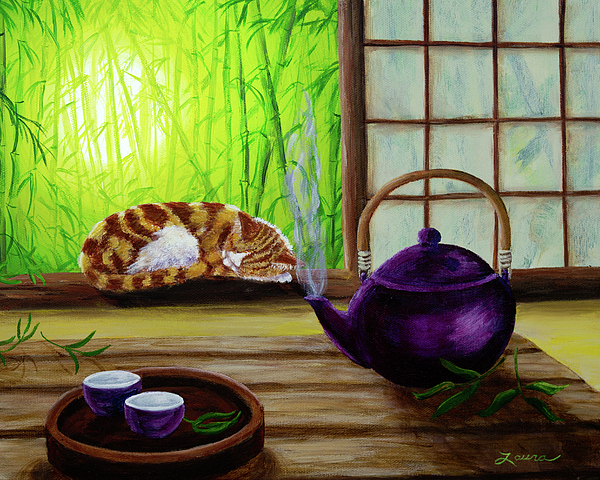 A darling orange kitten with white paws sleeps in the window of a Japanese teahouse (my kitten, Loki, was the model). 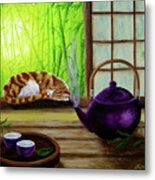 Steam rises from a purple ceramic teapot with a bamboo handle. 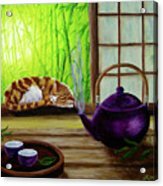 Teacups rest invitingly on a tray. Outside, the rising sun illuminates bright green Spring bamboo. Inspired by the Japanese tea ceremony.